When first walking in, you’re greeted with a friendly smile and a few sample cups, stacked and waiting to be self-served. Different flavors face you, all of which are gluten-free, non-fat or low fat and contain live cultures. But most importantly, they’re all delicious. Building your frozen yogurt masterpiece and choosing from a variety of toppings yields not only a delectable dessert, but a fun experience as well. 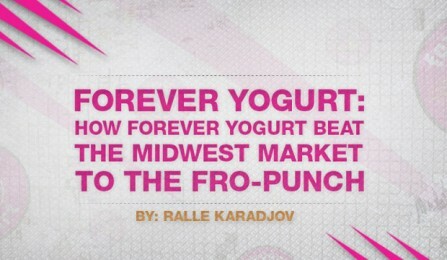 Welcome to Forever Yogurt, a Chicago-based gourmet frozen yogurt franchise that has been able to sustain and surpass frozen yogurt trend predictions and continue expanding on a national and global scale.